First thing any pilot, sim or live, should do before letting loose of the brakes or key the radio is to get prepared. You need to know where you are going, how long to get there and what to do once you get there. In the least you need to know what the airport looks like and what runways are usually available. It is a little hard lining up for a runway 20nm out then finding 5nm out that you have to go quarter way around the airport to get to the runway that actually exists. But I digress, ATC (Air Traffic Controller) says "expect vectors for ILS on runway 10." They aren't going to tell you what frequency to set on your navigation radio. Know where you are going. I'm going to assume you know how to get there. This is a map of KORD. Also known as Chicago O'Hare. If you take off from the default MS airport Meigs turn left (inland) and you should be able to notice it as a discolored spot in the near distance. If you fire up the map you should be able to find this distinctive airport. See the green arrows? They are pointing at the end of the runway. They are a visual indication of where you would find the ILS radio beam. Of course to hear/pickup a radio beam you need a radio. Pull up the radio stack and notice you most likely have 2 NAV radios. The first one (NAV1) is your main navigation radio. The second one is used to use as a backup, standby and to see intersections of 2 radio beams. If you tune your NAV1 radio to the ILS (Instrument Landing System) frequency your instruments should light up once you get into range. How do you figure out what frequency? Double Click on the airport (you may have to turn off the VOR icons that cover the airport) to get it's information. Down at the bottom is a list of runways. 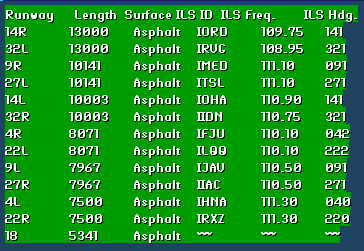 Along with with the runway number is the length of the runway, what type of surface it is and ILS information. Each ILS has an ID which is sort of like a radio station call sign. The frequency of the radio beacon is given and the ILS heading. The heading isn't extremely important as long as you are close, say using the runway's ID, but it helps. It isn't as important to have the exact heading as it is when using a VOR radial because of the way ILS equipment works. It acts like a fixed VOR. Once your radio picks up the signal it is locked on to the proper heading no matter what you set your Autopilot instruments to. Now that you have the proper frequencies and headings to use when you get there you can take off and approach the airport. Now for more preparation. You need to set your NAV1 radio to the ILS frequency. If you are flying IFR (Instrument Flight Rules) the ATC will tell you what runway you will be landing on. Look it up from the list we found earlier. You did write/print it down didn't you? If you are flying VFR (Visual Flight Rules) then call up the airport's ATIS (Automated Traffic Information System) and listen for the active runway. Then again, if you are flying VFR why are you using ILS? I know, for training, that is why you are reading this how to. 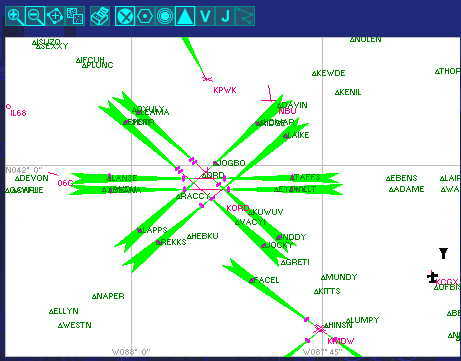 As a backup you may want to set your NAV2 radio to the VOR based at your selected airport if there is one. This will help you see when you are getting close to your ILS radial and give you an idea of where the airport is as you circle it. Next it will really help with your awareness of the situation if you set the course on your Autopilot to match the heading of the ILS you have selected. This will turn the indicator on your HSI to match the heading of your selected ILS. 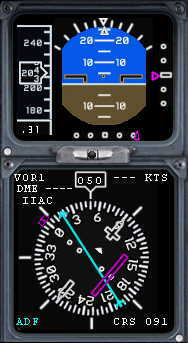 Assuming you are within range of the ILS you should notice a green bar off to the side of this indicator. This green bar represents an extension of the centerline of your selected runway. As you are approaching the threshold this bar will drift to the left as your aircraft drifts the the right of the centerline. There are two instruments on the Boeing and LearJet panels that shows most of the information that is important to you.